SHSU students can help fire up the football team on Thursday (Oct. 4) as they prepare to take on archrival Stephen F. Austin State for the 87th Battle of the Piney Woods in Houston. “Firefest,” the annual official pep rally, will begin at 7 p.m. at Intramural Field No. 3. The event will get warmed up with a lighting of the bonfire, a few words by head football coach Willie Fritz and performances by the Bearkat Marching Band, the SHSU cheerleaders, Sammy the Bearkat and the Orange Pride dance team. Bearkat football players will also be on hand during the event, which will also include free T-shirts, food and other giveaways. Kickoff for the Battle of the Piney Woods game, presented by YP.com, is 3 p.m. on Saturday (Oct. 6), at Reliant Stadium. For more information on Firefest, contact Student Activities at 936.294.3861. Reuben Sanchez, English lecturer at SHSU, will discuss biblical imagery and the fall of mankind, as visualized in early Western literature, on Friday (Oct. 5) as a presenter for the English department’s Friday Faculty Forum. "The Iconography of the Fall: Eve and the Serpent" will be held from 3-4 p.m. in Evans Complex Room 212. “The presentation will involve selected works from early Christian art through the 19th century. In particular I'm interested in the iconographic tradition that develops regarding Eve and the serpent,” Sanchez said. “John Milton's Paradise Lost (1667) falls within my area of interest; Milton's poem involves the Garden of Eden story, and Milton's source for that would, in part, be Genesis chapter three. Sanchez said his presentation has two general aims: “to suggest how the argument of a text can be visualized and to use the term text not only in its primary meaning but also in its secondary meaning as subject or topic. Sanchez, who has been teaching at SHSU for two years, earned his bachelor’s degree from the University of New Mexico and his master’s and doctoral degrees from Cornell University. His areas of expertise and teaching interests include Renaissance literature—including Milton and William Shakespeare—children’s literature, and Chicano literature. The English department’s Friday Faculty Forum is designed to highlight research by graduate faculty and graduate students. Presentations are open to the public, and a reception will follow the event. For more information on the Friday Faculty Forum series, contact Paul Child, professor of English, at 936.294.1412. Artists from around the country will reveal the results of an intersection between the body and the screen for an exhibit that will debut in the art department’s Gaddis Geeslin Gallery on Monday (Oct. 1). “Body and Screen Performative Video Works,” a series of 12 videos that will be projected in the gallery through Oct. 26, will feature pieces by Adan De La Garza, Tobias Fike and Matt Harris, Kate Gilmore, Leslie Hall, Casey McGuire, Wura-Natasha Ogunji, Linda Post and Tatiana Svrckova. “Rooting out of the traditions of 70s video art, its personal and intimate sense of voyeurism and inherent semiotics, ‘Body and Screen’ features artists who perform for the camera,” said exhibit curator Annie Strader, assistant professor of art. “The works included in the exhibition navigate a wide conceptual terrain offering a sampling of works by artists who use the camera to capture fleeting moments and the screen as a window for the viewer to stand witness. “Each artists video performance work explores unique ideas, including themes of personal history displacement, struggle and identity,” she said. A reception for the exhibit, during which some of the artists, including Post, will be on hand to discuss their pieces, will be on Thursday (Oct. 11) from 6-7 p.m. in the Gaddis Geeslin Gallery, located in Art Building F Room 101. Post will also visit campus earlier that day and give an artist lecture at 5 p.m. in the Art Auditorium, in Art Building E Room 108. The following week, De la Garza will come to SHSU to present his own artist lecture, at 5 p.m. in the Art Auditorium. This exhibit represents what can be seen as emerging areas of interest in art, especially as the 21st century has led to an increased accessibility to digital technologies through means such as video functions on phones, the addition of editing software on personal computers, and outlets such as YouTube that allow free hosting of those videos, according to Strader. “Both video and performance art became a more common medium for artistic expression in the 1960s and 1970s and have since been an increasingly important art form,” she said. “Artists like Marina Abromovic, Vito Acconci and Bruce Nauman were all pioneers of creating performances for the camera and this means for expression has not lost it's potency over the years. For more information on the exhibit, contact Strader at 936.294.1322 or srs033@shsu.edu. The Sam Houston Memorial Museum will bring a “home front” perspective to the Texas Revolution, focusing on its impact on families already living in the state during a presentation on Thursday (Oct. 4). “At Home in a Revolution,” which will be from 4-6 p.m. at the Big Bear Cabin, on the museum grounds, will feature costumed historians who, with attendees, will explore the Texas militia, home defense, and the role of women and children in the revolution. “In some ways, it was like the Civil War,” said Danielle Brissette, museum historical interpreter. “Battles were being fought in people’s fields and front yards. Armies were camping in their towns and plantations. The civilians in Texas were very close to the action, literally and figuratively. To lighten up the very serious topic, the museum’s education department will make hardtack, or hoe-cakes, to show some of the things that the Texians would have carried with them. Visitors will be welcome to sample some of the food. A $3 donation is recommended per person. For more information, contact Megan Buro, Sam Houston Memorial Museum marketing coordinator, at 936.294.3839. The SHSU English department will continue its offering of foreign cinema with a series of presentations for the month of October. The Foreign Film Festival, hosted by professor emeritus Ralph Pease, will kick off for the month with a screening of the 1981 United Kingdom film “Chariots of Fire” on Tuesday (Oct. 2). The presentation, like all of the festival’s showings, will be held twice that day, at 3:45 p.m. and again at 7 p.m. in Evans Building Room 105.
that tells the story of two remarkable athletes—one Jewish and one Protestant—as they compete in the 1924 Olympics, according to Pease. The film is 123 minutes long. The following week, on Oct. 9, the department will showcase Great Britain’s “A Night to Remember,” a 123-minute movie that is notable for its more than 200 speaking parts. Attendees are warned that this film is not for children. The 1961 film, whose screenplay was written by Truman Capote and others, deals with the possible possession of two children by evil spirits, which makes it a film that is probably not suitable for younger viewers, Pease said. The Foreign Film Festival showings are free to all SHSU students, faculty, staff and their guests and are sponsored by the English department and the College of Humanities and Social Sciences. For more information, call Pease at 936.294.1436. Sam Houston State University’s School of Music will welcome a group known for its standard-setting performances of the classical brass quintet repertoire on Wednesday (Oct. 3). The Center City Brass Quintet will perform a guest artist concert that day beginning at 7:30 p.m. in the James and Nancy Gaertner Performing Arts Center Concert Hall. The group is comprised of America’s top brass talent who hold positions in some of the nation’s finest orchestras and perform the world over as sought-after soloists. Their programs often include staples of the brass repertoire as well as original compositions and transcriptions of contemporary classics by Bernstein, Gershwin and Ellington. “They are one of the hottest groups on the scene right now for what they do,” said Scott Plugge, director of the School of Music. Tickets are $15 for general admission, $12 for senior citizens, and $5 for SHSU students. For more information, call the School of Music at 936.294.1360. Educators, librarians, those who work with children and young adults, students, and fans of authors Richard Peck, Janet Stevens and Susan Stevens Crummel will have the opportunity to learn from the professionals during the annual Jan Paris Bookfest on Nov. 3. The annual children and young adult conference, hosted by SHSU’s library science department, will be from 8:30 a.m. to 4 p.m. in the Academic Building IV Olson Auditorium. The event will include a series of sessions presented by authors and area teachers on topics applicable to children ranging in age from prekindergarten to eighth grade. Among the topics discussed will be “A Tale of Two Windows: The Picture Window and The Fairy Tale Window,” during which participants can learn about interactive Story Window programs for young children; a SKYPE chat with author Mary E. Pearson; a hands-on art session with Caldecott Medal winner David Diaz; a visit with paranormal sci-fi author Belle Whittington; and “Make Some Noise!—Using Your Voice Effectively In Storytelling,” during which Sue Young will show her audience how to portray different characters, add sound effects, and participation into songs, chants or rhymes. The keynote speakers for the event will be Peck, Stevens and Crummel. Peck is the author of “Strays Like Us,” “A Long Way From Chicago,” “A Year Down Yonder,” and “Fair Weather,” which he says “celebrate the world” as a child. A former public school teacher, Crummel is the author of “Helm Me, Mr. Mutt,” “The Great Fuzz Frenzy,” “Cook-a-Doodle-Doo!,” which won the 2001 Texas Bluebonnet Award, and “And the Dish Ran Away with the Spoon,” winner of the 2004 California Young Reader Medal. The Jan Paris Bookfest is designed to provide educators and other people interested in children’s and young adult literature an opportunity to listen to and visit with award winning authors, according to Karin Perry, assistant professor of library science. “The breakout sessions provides wonderful professional development for the educators in attendance,” she said. In addition, all three are exciting additions to this year’s program, Perry said. “Richard Peck is ‘classic’ when it comes to young adult literature. He has made numerous contributions to modern young adult literature and was awarded the Newbery Medal in 2001 for his novel ‘A Year Down Yonder,’” she said. “He will also be awarded the first ever given SHSU Department of Library Science’s ‘Outstanding Contribution to Youth Literature’ Medal. Event registration is $100 per person, and the registration deadline is Oct. 15. In addition, books from attending authors will be available for purchase and all three keynote speakers, as well as Diaz, will be available for autographs during the event. The SHSU physics department will take audiences on “The Great Space Race,” highlighting the stories of the United States and Russian space programs with its planetarium series program on Friday (Oct. 5). The show, written by high school students in Utah, will begin at 7 p.m. in Farrington Building Room 102. In addition, Prokosch will show participants which constellations they can expect to see in the fall skies, including Pegasus, Cassiopeia, Perseus and Andromeda. “These are the main characters in the movie ‘Clash of the Titans,’” he said. “The Great Space Race” is a family show, with “something for everyone,” Prokosch said, adding that audiences are invited to stay after the hour-long presentation to ask questions or discuss events covered during the program. Future presentations are scheduled for Dec. 7, and the planetarium will present its other semester program “Nature of Science” on Nov. 16 and Dec. 14. For more information, contact Prokosch at 936.294.3664 or visit the Planetarium WikiPage at shsu-planetarium.wikispaces.com. Texas high school criminal justice teachers can catch up on some of the “prime time” issues and topics currently being addressed in the field during the SHSU College of Criminal Justice’s annual conference on Oct. 11-12. The High School Criminal Justice Instructors Training seminar will include a day and a half of presentations focused around the theme of “Truths and Misconceptions in the Media,” including discussions on crime in the media, women in criminal justice, forensic science and anthropology, high tech crimes, photography and gangs. Participants will have the opportunity to tour SHSU’s Southeast Texas Applied Forensic Science Facility, known as the “body farm,” and tour the Polunsky prison unit located in Livingston. The cost for the seminar is $60 per person, and the registration deadline is Oct. 5. Participants will earn 12 continuing education hours, and those who are also licensed peace officers will earn 12 TCLEOSE credit hours. Registration is available online at cjcenter.org/temp/HSCJIT.php. Accommodation information also is available online at cjcenter.org/camps/hscjit.html. For more information, contact Eads at keads@shsu.edu or 936.294.4735. 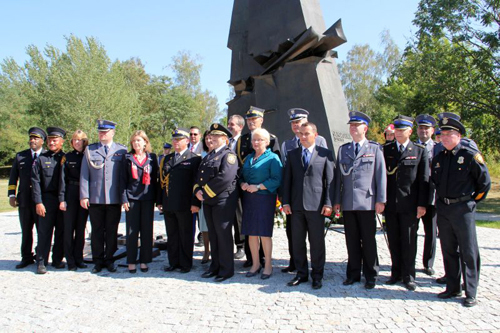 For the third year in a row, representatives from the Law Enforcement Management Institute of Texas participated in a ceremony at Homo Homini, the Polish memorial to Sept. 11, which has come to symbolize the fight against terrorism around the world. The LEMIT delegation, which included graduates of its Leadership Command College and staff, joined top-ranking Polish officials and the Consul General in remembering the attacks. The day is memorialized in “Homo Homini,” which depicts two towers sliced by a plane. Every year, the monument adds plaques from other major terrorist attacks from around the world, which now includes Moscow, Madrid, Jerusalem, London, Beslan, Bali, Grozny, Bombai, Istanbul, Sri Lanka, Sharm El Sheik and Utoi. LEMIT’s international police program is an effort by Texas law enforcement agencies to learn and share best policing practices around the world. The delegation participated in a two-week tour of agencies throughout Poland and included Captains Cris and Laura Andersen, of the San Antonio Police Department; Michael Dirden, executive assistant chief in Houston; Lt. Commander David McGinty, of the Arlington Police Department; and Chief Nancy Juvrud ,of the Calvert City Police Department. The ceremony was attended by high-ranking officials from the police, fire and emergency medical services in Poland and Kielce, the host city. Among those were the Kielce City President Wojciech Lubawski; Commander-in-Chief T. Kwiatkowski, of the Polish Fire Services; Commander-in-Chief General Marek Dzialoszynski and General Marek Dzialoszynski, of the Polish National Police; Swietokrzyski Deputy State Chief Waldemar Wodkowski; and Kielce City Police Chief Robert Szydlo. As part of the solemn ceremony, 3,000 school children placed candles at the monument with the names of the victims of the World Trade Center attacks. In order to assist members of the Sam Houston State University community in publicizing events, the SHSU Communications Office (Today@Sam) is now requesting that students, faculty and staff submit information about events, accomplishments or ideas for feature stories online. Submission criteria and guidelines, including deadlines, have now been placed online, at https://www.shsu.edu/~pin_www/guidelines.html. This information is also accessible through the “Submissions” link in the right-hand navigation on Today@Sam. From there, those submitting ideas can access forms that will allow them to provide detailed information about their idea, as well as attach event calendars, vitas/resumes or photos, depending on the type of submission. Ideas submitted to the SHSU Communications Office are directly utilized in several ways: as news stories, “slider” or SHSU home page stories, hometown releases, and on the Today@Sam calendar. If your submission qualifies for distribution, we will either contact you for more detailed information, or we will edit the information using SHSU/journalistic style and forward the final release to the appropriate media. All information is verified before release, so please provide complete, accurate and timely information. Please type all responses in appropriate upper and lower cases. For more information, contact the Communications Office at 936.294.1836 or today@sam.edu.